Count Iosif Vladimirovich Romeyko-Gurko (Russian: Ио́сиф Влади́мирович Роме́йко-Гурко́; July 28 [O.S. July 16] 1828, Veliky Novgorod — January 28 [O.S. January 15] 1901), near Tver), also known as Joseph or Ossip Gourko, was a Russian field marshal prominent during the Russo-Turkish War (1877–1878). Of Belarusian/Polish extraction, Gurko was educated in the Imperial Corps of Pages, entered the hussars of the Imperial Guard as a sub-lieutenant in 1846, became captain in 1857, adjutant to Alexander II of Russia in 1860, colonel in 1861, commander of the 4th Hussar Regiment of Mariupol in 1866, and major-general of the emperor's suite in 1867. He subsequently commanded the grenadier regiment, and in 1873 the 1st Brigade, 2nd Division, of the cavalry of the Imperial Guard. Although he took part in the Crimean War, being stationed at Belbek, his claim to distinction is due to his service in the Turkish war of 1877. 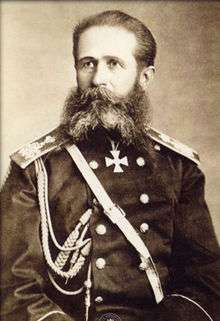 He led the spearhead of the Russian invasion, took Tarnovo on July 7, crossed the Balkans by the Haim Boaz pass—which debouches near Hainkyoi—and, despite considerable resistance, captured Uflani, Maglizh and Kazanlak; on July 18 he attacked Shipka, which was evacuated by the Turks the following day. Thus within 16 days of crossing the Danube, Gourko had secured three Balkan passes and created a panic at Constantinople. He then made a series of successful reconnaissances of the Tundzha valley, cut the railway in two places, occupied Stara Zagora (Turkish, Eski Zaara) and Nova Zagora (Eni Zaara), checked the advance of Suleiman Pasha's army and returned again over the Balkans. In October he was appointed commander of the allied cavalry, and attacked the Plevna line of communication to Orkhanie with a large mixed force, captured Gorni-Dubnik, Telish and Vratsa and, in the middle of November, Orkhanie itself. Pleven was isolated, and after its liberation in December Gourko led his troops amidst snow and ice over the Balkans to the fertile valley beyond. He liberated Sofia and decisively defeated Suleiman Pasha at the Battle of Philippopolis and occupied Adrianople. The armistice at the end of January 1878 stopped further operations. Gurko was made a count and decorated with the 2nd class of St. George and other orders. In 1879–1880 he was governor of St. Petersburg, and from 1883-1894 Governor-General of Poland, where he enforced the Russification policies of Alexander III. This article incorporates text from a publication now in the public domain: Chisholm, Hugh, ed. (1911). "Gourko, Joseph Vladimirovich". Encyclopædia Britannica. 12 (11th ed.). Cambridge University Press. p. 288.